As a rule, I don't make New Year's Resolutions. They tend not to work for my personality. I am easily distracted by new discoveries and ideas--Oh, look! There's a squirrel!--which means smaller goals, quickly taken up before the impulse blows away, are more realistic. Until, this year. This year, kittens, I have resolutions. The broad, sweeping sort that require attention throughout the seasons. More remarkable yet, I kept these resolutions for a whole month! It helps that both resolutions deal with my wardrobe. Apparently, if a goal is legitimately fun and involves new clothes, I can keep it. Shocking, I know. So, what are these mysterious yearly ambitions? First off, I need to stop sewing so many secret pajamas. 2015 was a year of slipping style. Time and time again, I found myself sewing something because it seemed comfortable, not because I truly loved it. That feels both wasteful and grim. What's the point of sewing, if I'm not at least trying to make clothes I adore? Basics are necessary, but there's no need to lose my point of view entirely. * Comfort and beauty must coexist. This year, I resolve to sew more garments that speak to my personality. My second resolution is heavily related to the first. After coveting their patterns for months, I finally have a subscription to Knipmode, that glamorous Dutch pattern magazine! My mother, the Queen of Cool, sprung for it as a much-beloved Christmas gift. I am obsessed, y'all. Here are the patterns I wish Indies were making--skirts with interesting design details, dramatic jackets, and modern, feminine dresses. The aesthetic is exactly what I want to be sewing, right now. Of course, the only way I can rationalize having an esoteric sewing magazine flown to my doorstep--in a language I don't speak, no less--is to actually sew these patterns. So, I am resolving to make at least one Knipmode pattern per month, this year. *Why, yes, I did finally watch the Iris Apfel documentary. That woman is a national treasure. Look, I made a skirt! This particular pattern is from the October 2015 issue of Knipmode and is also available online, as a PDF. The asymmetrical style is decidedly dramatic, with knife pleats marching along the skirt and a hem sweep that dips almost eight inches from right to left. 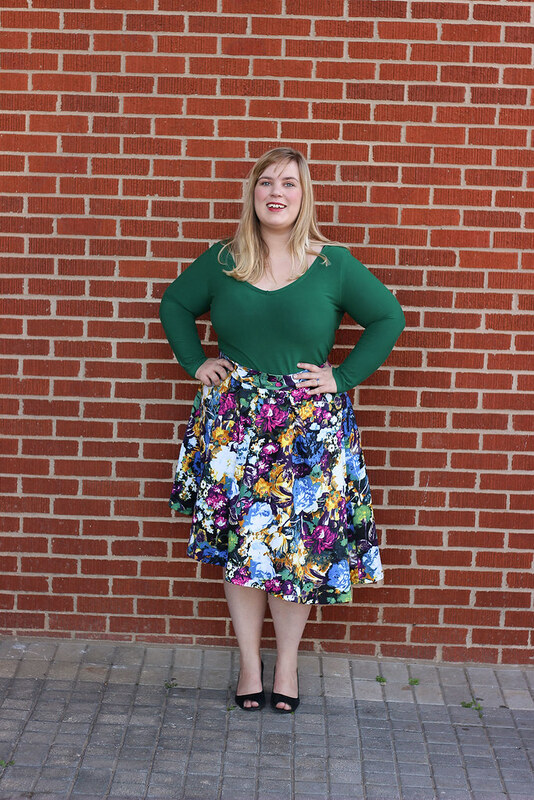 This pattern is at once a classic full skirt and something more modern entirely. Even without instructions, an intermediate seamstress could whip this garment out easily. 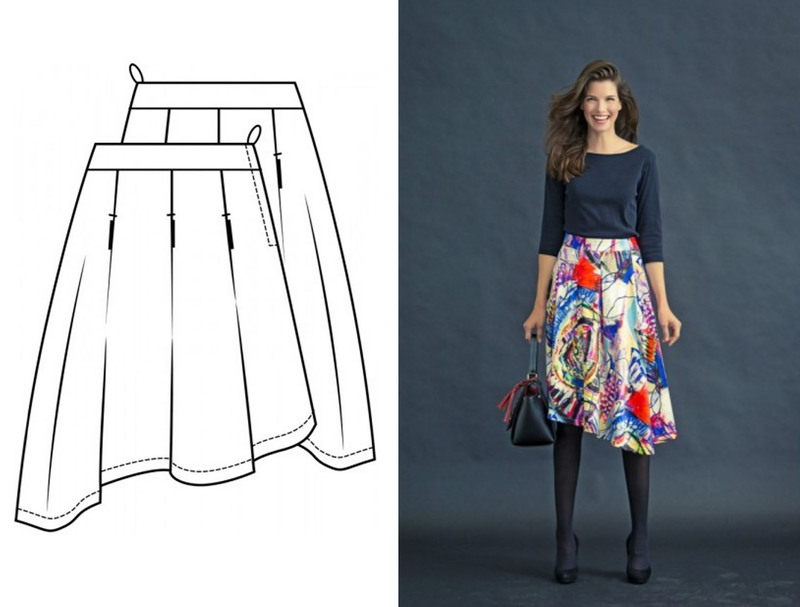 Make a few knife pleats, finish the seams, then add the waistband and an invisible zipper. Voila! Instant skirt. I treated this pattern as a Knipmode trial run, however, and fully translated the directions. Google Translate actually handles Dutch to English translation really well, picking up even technical sewing terms, like “seam allowance” and “overlock.” I have it installed as a Chrome plugin, for foreign-language websites, and am consistently impressed with its accuracy. For the few words that wouldn’t translate readily, the wonderfully helpful Marianne pointed me toward this fantastic Dutch/English sewing glossary. To pull off such a bold silhouette, fabric choice was key. While this would look sensational in a solid fabric, I wanted a print similar to the modeled skirt, something heavily influenced by art. This watercolor floral cotton sateen from Mood matched that vision perfectly. When it arrived, I was so smitten that I promptly ordered another three yards of its other colorway, which is a riot of yellows and reds. Both fabrics are a heavier cotton sateen, ideal for an unlined skirt like this one, and have just enough stretch to lend a little comfort. Better yet, they drape gloriously, creating hemlines that swirl and dance with every step. The most time-consuming part of this garment's construction was tracing out the pattern and translating the directions. When you receive the magazine, there are pattern sheets folded up in the center, corresponding to the various garments included. 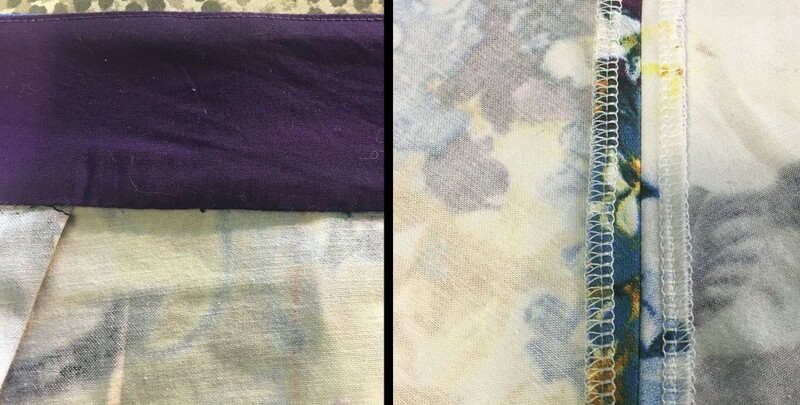 Two or three patterns usually take up a sheet, overlapping each other in different colors of ink, with sizes EU 34-54 included. The process is actually deadly simple, though--I outlined my size in bright sharpie, put a roll of bee paper down, then traced over my pattern pieces. The lines are really well marked and it's easy to determine which pieces are yours. Of course, there is one last step. Knipmode patterns, like Burda, don't come with seam allowances. To American sewers, this can be a stumbling block that keeps us from trying out these magazines, but it's a non-issue. There are a variety of foolproof ways to add in seam allowances. You can trace your pieces right onto fabric, then sew by seam lines and use a rough allowance, which is the couture way of sewing. Clover also makes double tracing wheels, clever little tools that add seam allowances as you trace off the pattern itself. Or...you could channel my swashbuckling ways and tape two sharpies side-by-side, then trace out your patterns with that. The resulting seam allowance, added at the same time you're tracing the original seam lines, is exactly 1/2 inch. All in all, the tracing process took me about an hour, including cutting out the final pieces. I'd much rather do that than tape together a gigantic PDF pattern! Though, incidentally, if you do order a Knipmode PDF pattern, you don't have to go through the tracing bonanza. There's only one pattern per PDF and it's laid out just like a normal pattern. Add seam allowances and you're good to go. As expected, the actual construction of this skirt was a cinch. This sateen sewed up beautifully, taking pressing really well and allowing lines of stitching to almost disappear into the print. Though the pattern's line drawing shows the asymmetry falling from left to right, I chose to copy the modeled version instead. The back and front skirt pieces are identical, so I inserted the zipper on the longer side and reversed the hem sweep. On my version, the left side now possesses the longer hem. Construction-wise, I made things a little more elaborate to suit my preferences. The waistband is lined with coordinating royal purple cotton, which was understitched to turn the facing, then sewn to the bottom waist seam by hand. 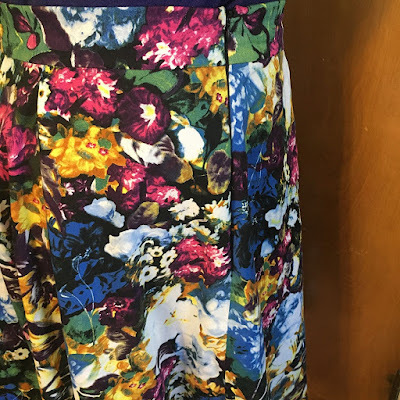 The seam allowances were finished with my serger, but I did sew the hem itself up by hand and eased it into the skirt. Originally, this pattern was meant to have a hem facing, but I prefer a fairly deep hem on such a full skirt. It gives the hem more body than a faced or narrow hem would. To that end, I lengthened the hem by three inches and turned it up twice, catch-stitching it to the inside fabric. Finally, the invisible zipper was also put in by hand, but that’s simply because I can’t find my invisible zipper foot! It has been lost to the clutter of my sewing room. Until it appears again, everything at Chez Danielson-Perry is getting a hand picked zip. 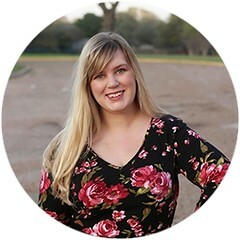 Laura Mae has a splendid article about inserting invisible zippers by hand, if you're curious. Wonders never cease! I've kept a resolution for one whole month! As I anxiously await the March issue of Knipmode, I'm turning my eye to another pattern, a riding jacket from the November issue. The pattern has been muslined already and needs a few small fitting tweaks, before I cut out some dishy black velvet for its grand debut. 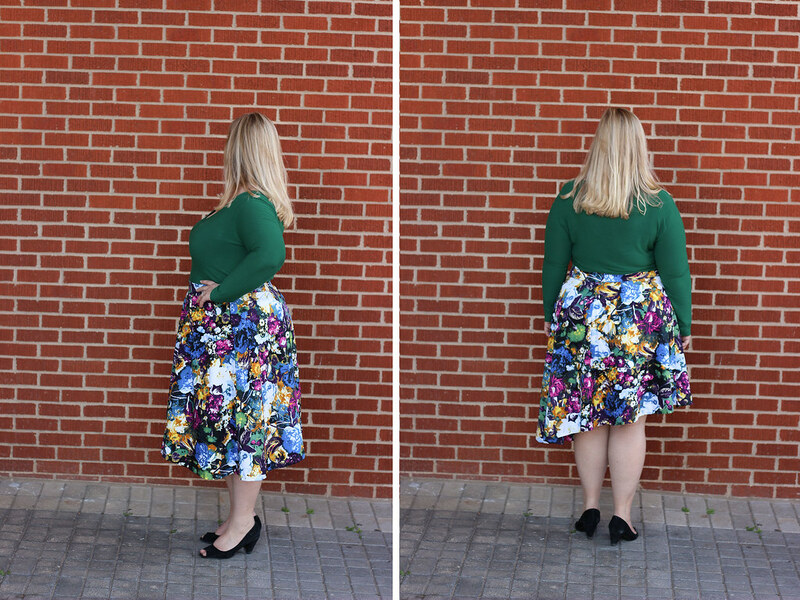 For now, I'm enjoying this swishy modern skirt. Both fabric and pattern feel deeply appropriate for my current wardrobe longings. This garment seems like the logical progression of my style, from when I started this blog six years ago. It's feminine, yes, but not overly sweet. It's utterly wearable, but not something you'd find at any ready-to-wear shop. Mostly, it just feels very, very me. 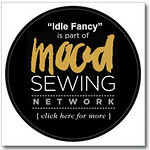 Note: The fabric for this project was given to me courtesy of Mood Fabrics, as part of my participation in the Mood Sewing Network. It was chosen by me, however, and all opinions are my own.